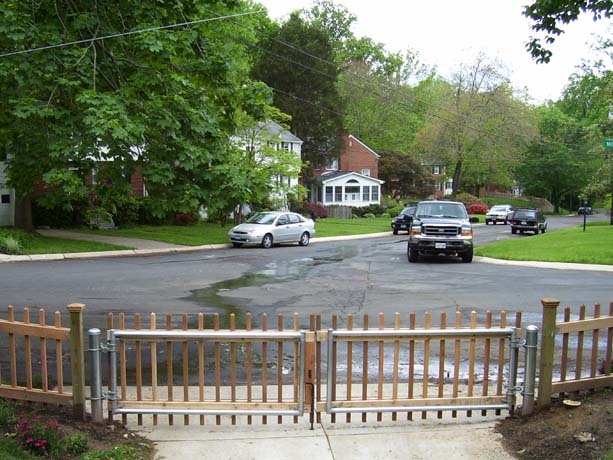 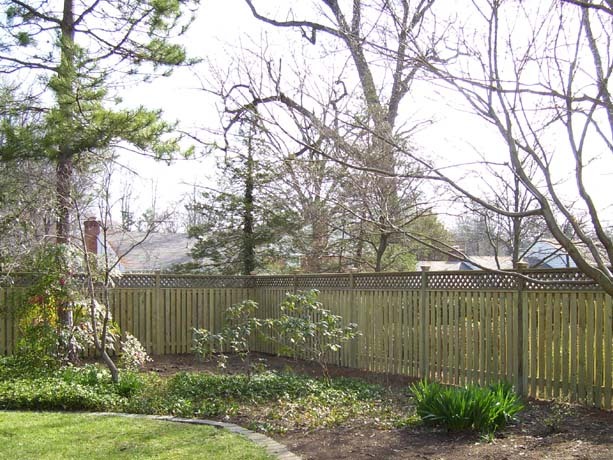 Joining Aluminum Fence and Wood Fence – Unlimited possibilities to get the beauty of both. This is a custom made lattice fence with an Arbor. 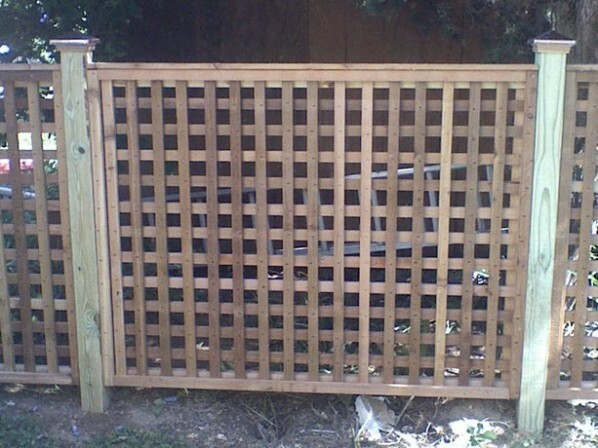 A custom made lattice fence. 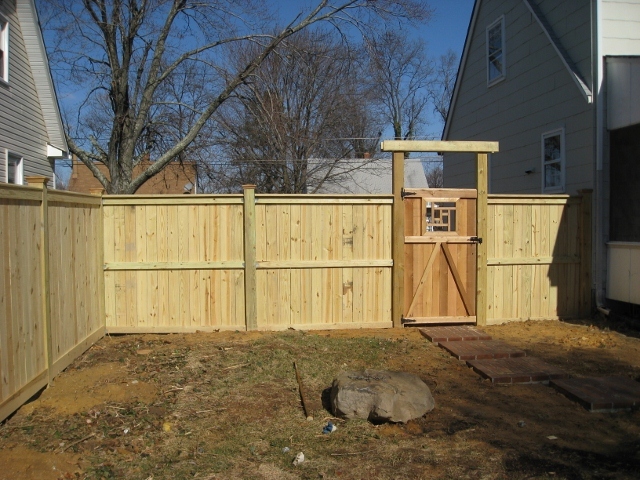 Board and Batten fence built on a sloped yard. 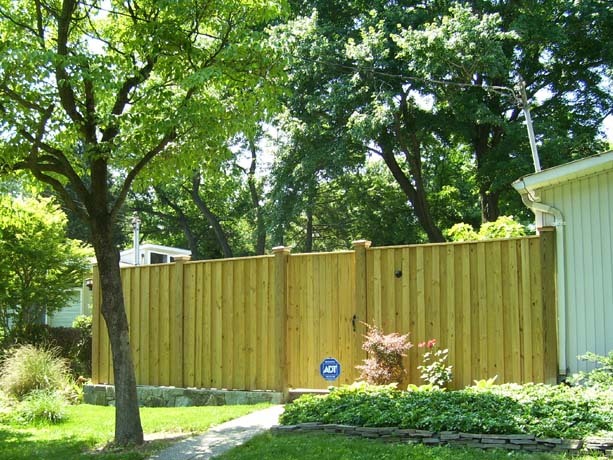 See how gracefully the fence hugs the landscape. 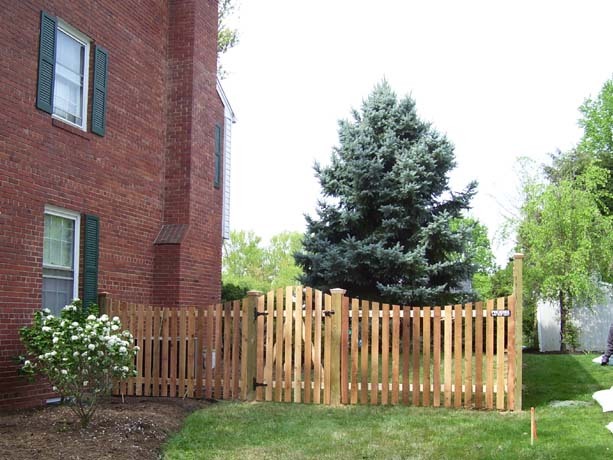 Crossbuck fence is a terrific style for an open, natural-looking fence. 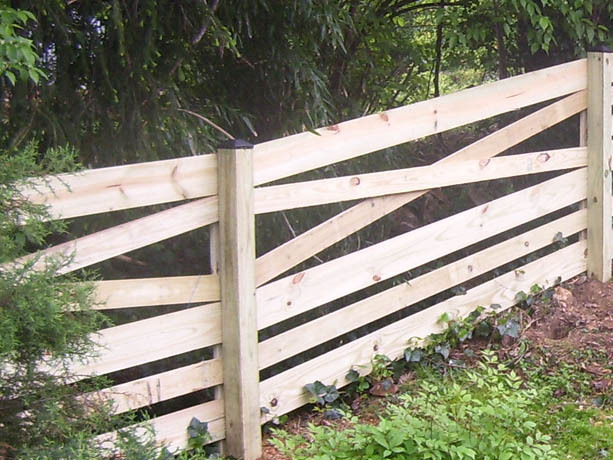 A cross-buck fence can be used as a corral fence to contain horses or as a property fence. 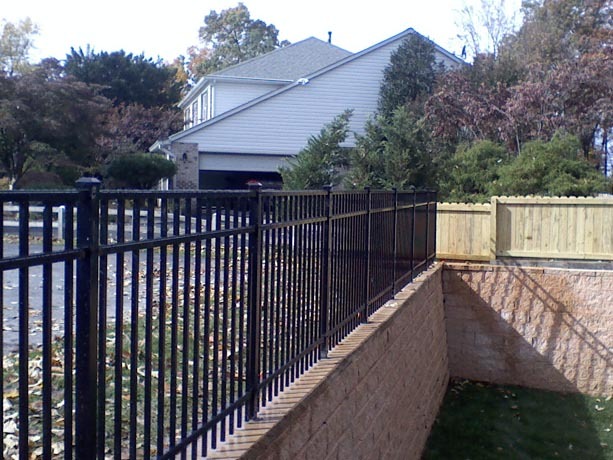 A wire mesh can be affixed to the inner or outer face of the crossbuck fence for additional protection. 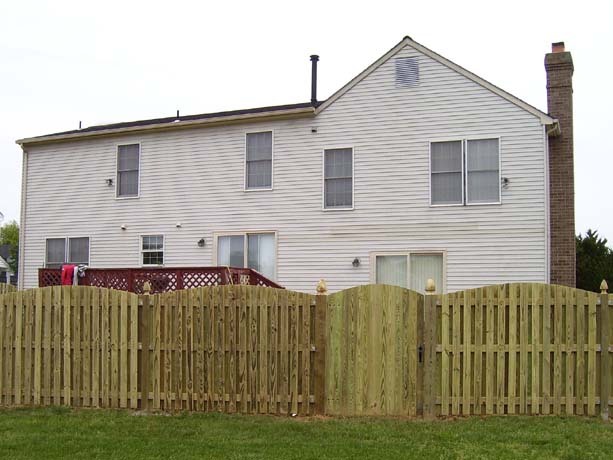 Our cross-buck fences are available in 4 rail, 5 rail or 6 rail styles. 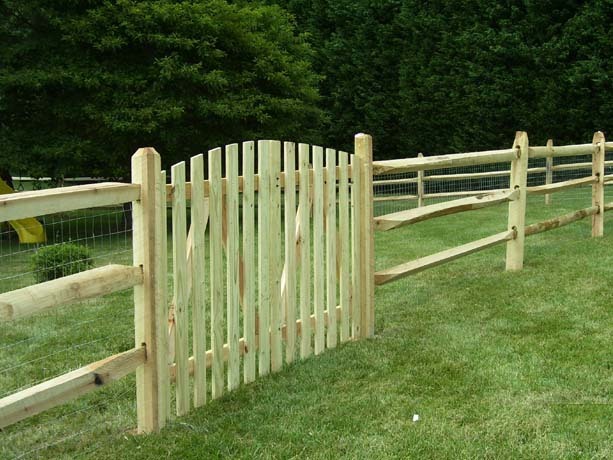 Split Rail fence, Arched Gate with Wire MeshThe following is a Split Rail fence with an arched gate. 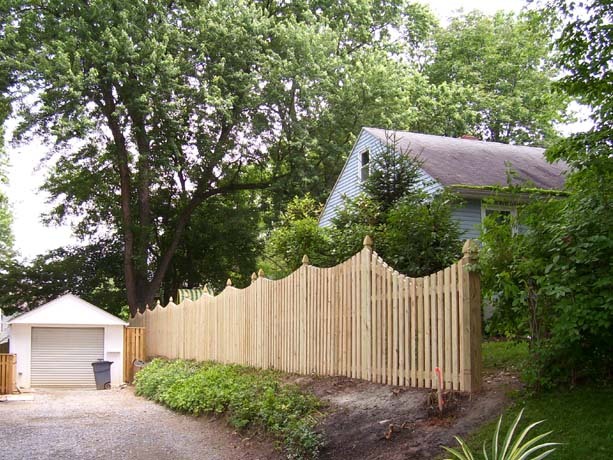 See how it beautifully merges with the landscape. 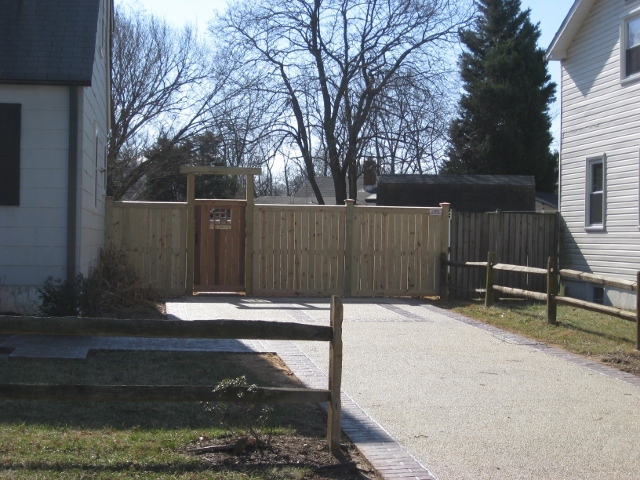 There is also wire mesh added to the fence for pet protection. 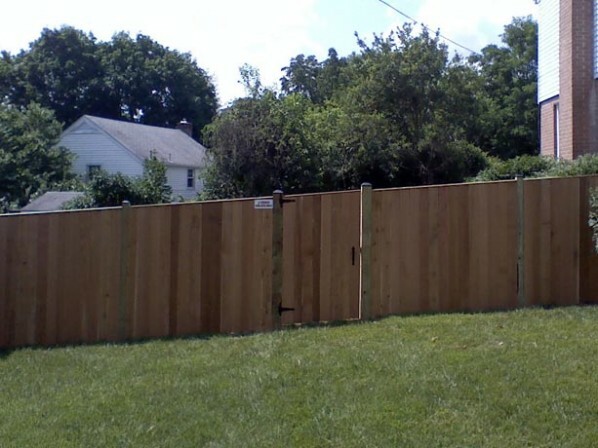 Flat board with cap board attached by Teco Nail Flat Board fencing is an economical privacy fence. 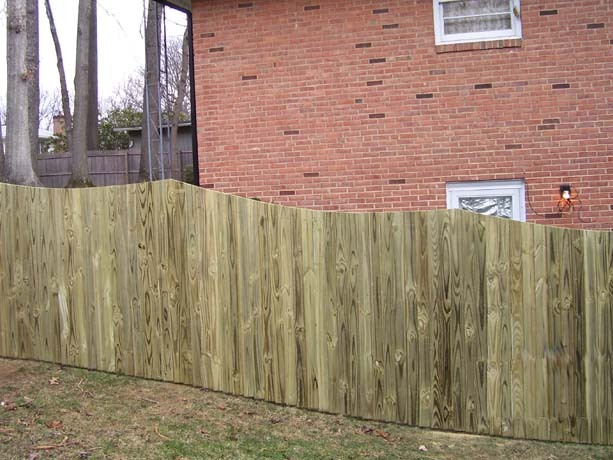 It is also a very popular fence. 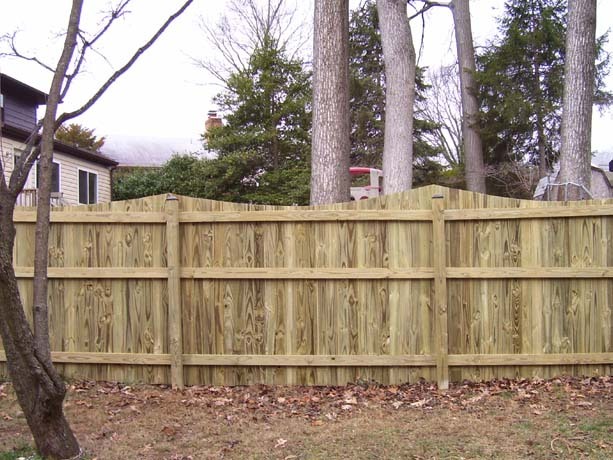 The picture shows a flat board fence with a cap board on top. 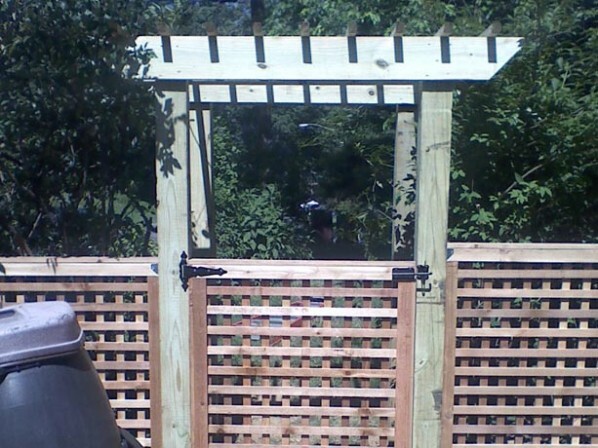 The boards are attached by Teco Nails. 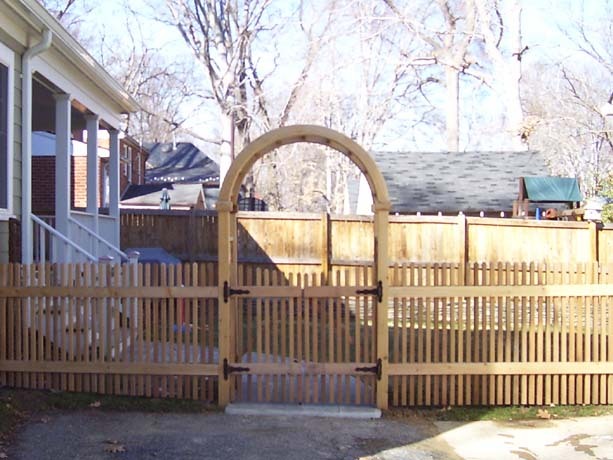 The gate is further decorated by concaving. 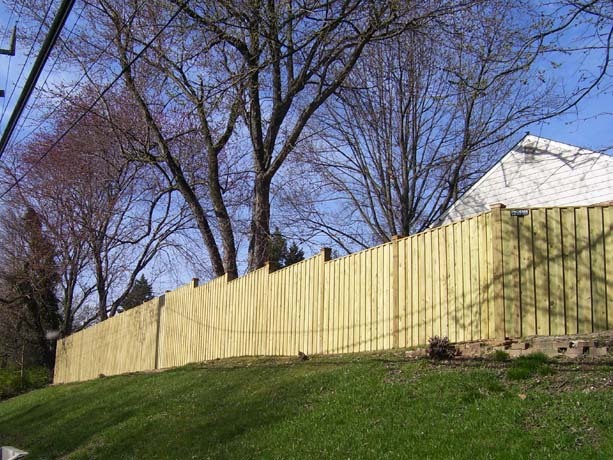 A Board and Batton Fence is constructed by placing boards edge to edge and covering the seams with a narrow strip of wood called batton. It also has colonial gothic top post. 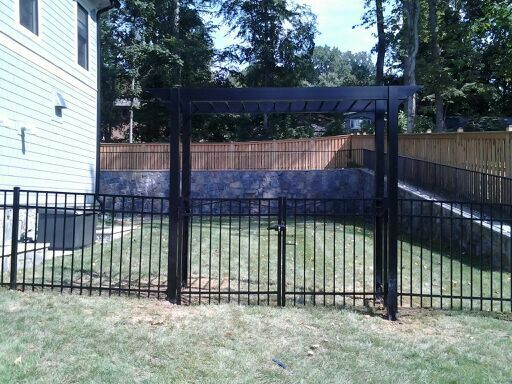 Wyngate (Shadow Box) with oval top It also has colonial gothic top post. 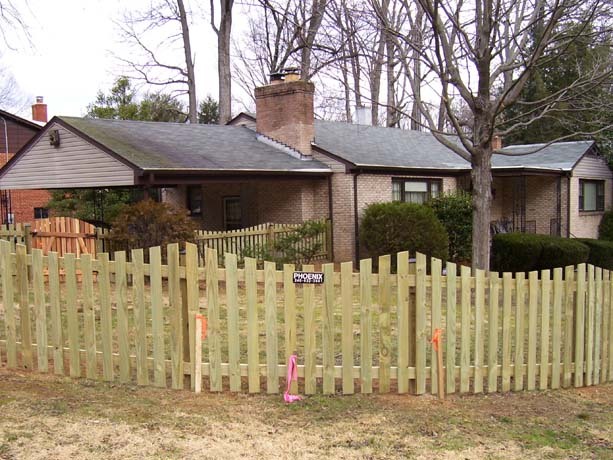 2 x 2 Picket Fence with gates re-inforced by steel frame See how the front view hides the steel frame which is visible in the back view. 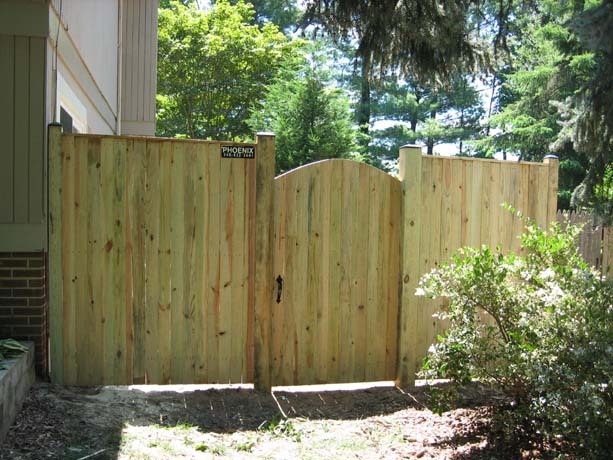 This is what we recommend for any large gate because wood is not strong enough. 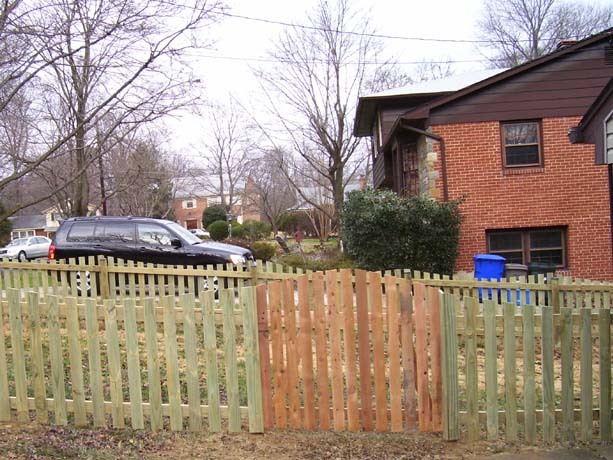 2 x 2 Picket Fence with gates re-inforced by steel frame. 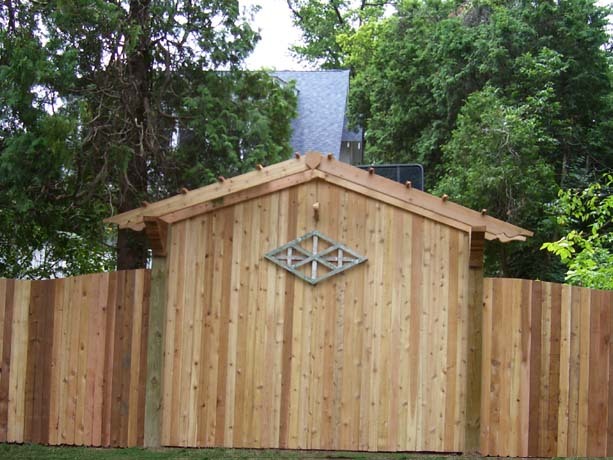 The steel frame is visible in this back view. 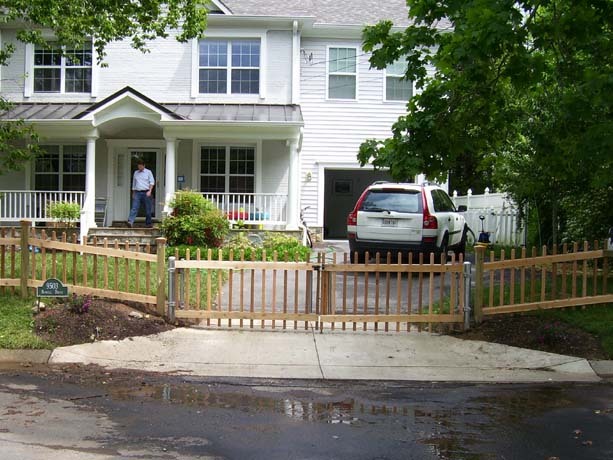 See how the gate merges with the fence.